As part of our quest to find the most romantic experiences around the world, we asked other travel bloggers to submit their pick for the most romantic experiences in the USA. We’re a traveling couple, so we look for stunning sunsets and cozy restaurants wherever we go. However, we love how some of these bloggers thought outside of the box to create romantic experiences with their significant others. Experiencing romantic things around the world is a great way to experience the world, and these romantic things to do in the USA are a great place to start! 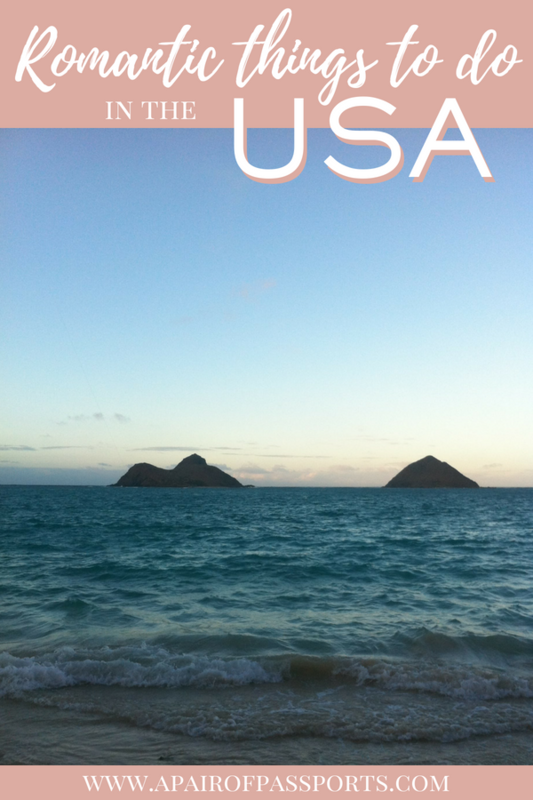 The USA is massive and full of all sorts of romantic experiences; however, it seems that most of the romantic experiences our blogging friends have experienced are located near the coast or in Hawaii. So, we’ve divided this list of romantic experiences in the USA by location – romantic experiences on the East Coast; romantic experiences on the West Coast; and, romantic experiences in Hawaii. Keep on reading for all the romance inspiration you’ll ever need! Check out the most romantic experiences in Europe! 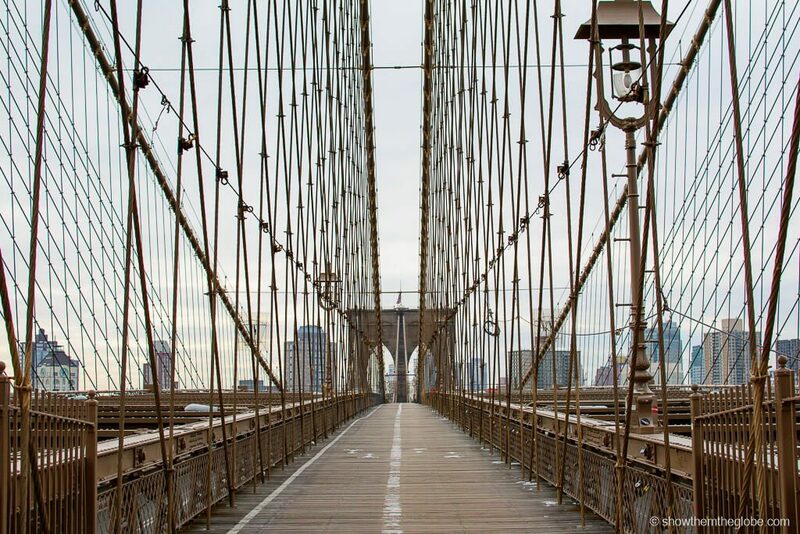 The Brooklyn Bridge, linking Manhattan and Brooklyn, is a New York icon and, as the sun sets across the city there is nothing more romantic than following its path from Brooklyn to Manhattan. Locals and tourists come together on the bridge as Manhattan basks in the evening sunset glow and, when darkness takes hold, the city twinkles in anticipation of the night ahead. The views of Manhattan are incredible: all of its most famous buildings make an appearance from One World Trade in the financial district to the Chrysler building and the Empire State in Midtown. The bridge is a constant hive of activity with runners, cyclists, commuters and walkers sharing the bridge. Bicycle bells ring amid shouts of ‘mind the bike lane’, music blares from a passing speaker and horns blast from the car bridge below. Despite all the commotion, when you stroll hand in hand towards the city there’s a sense of hope, dreams and endless possibilities. I dare you not to fall in love with each other and New York City just a little bit more. Research has shown that attraction increases with an adrenaline rush. For adventurous couples, doing a via ferrata is a perfect way to support each other while ticking off your bucket list! Via ferrata is a form of rock climbing invented in Italy that involves climbing on rungs that have been drilled into the rock and using steel cables to access alpine areas that would be difficult to climb otherwise. It is very safe and, in the US, all routes require that you have an experienced professional with you at all times. 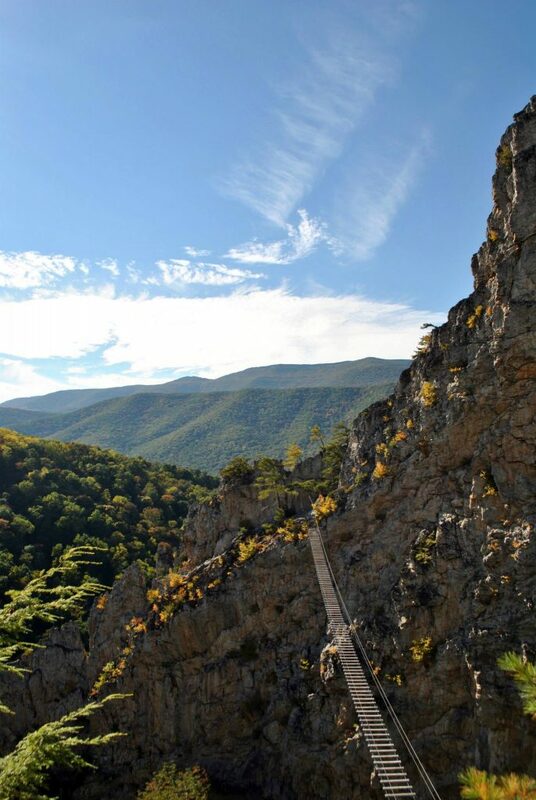 The most romantic via ferrata route that I did with my partner was in Nelson Rocks, West Virginia. On this course, you climb up and across a fin-shaped rock prior to crossing a bridge 150 feet in the air before climbing across another fin. Even for me, it was a bit scary at points; however, my partner encouraging me made me feel confident to push on. Holding his hand as I came around a bend to look when we were 280 feet up off the ground on exposed rock face was one of the most romantic things we’ve done. Since then, we’ve done via ferrata/climbing in seven countries, including climbing the world’s tallest climbing tower while belaying for each other. The most rewarding and epic moment after a climb is when you both look out (or down) at what you just climbed and embrace each other with the adrenaline still rushing. It’s not for everyone, but for those who love the outdoors or want to spice up their relationship, rock climbing is a great way to push yourself and your relationship to the next level. 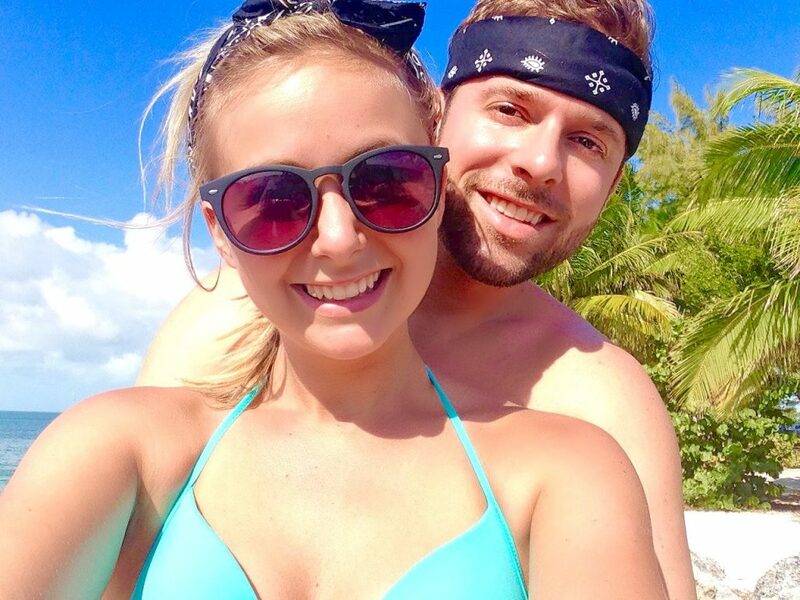 One of our most (surprisingly) romantic experiences was camping ocean side in the Florida Keys! It’s easy to fall in love with the Keys, from the moment you drive into this secluded beach town and are surrounded by shades of blue from the Atlantic and the Caribbean on each side of you. 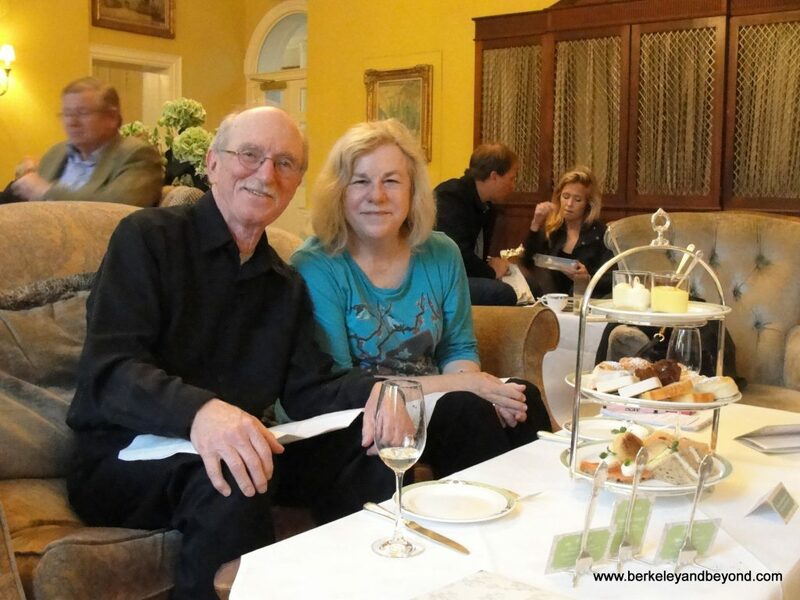 We knew we picked our perfect romantic getaway the minute we drove onto iconic highway 1 into the Florida Keys, but would our adventurous accommodation offer the same romantic ambiance? We decided to skip out on the typical condos and resorts that most choose when they travel to The Keys and pitch a tent right next to the ocean. You know those moments where you feel like you’re falling in love all over again? This was one of those. Falling asleep underneath the stars and waking up to the sound of the waves, with nothing but the comfort of your partner next to you is pure bliss. Never be afraid to try something just out of your comfort zone when planning a romantic adventure. The sunrises and sunsets from the summit of Cadillac Mountain at Acadia National Park are nothing short of incredible and, without a doubt, the best way to enjoy them is with your favorite someone! Take your partner up to one of the prettiest viewpoints in Maine and enjoy watching the sky change colors over all the islands in the distance. Though the spot is popular and you likely won’t be totally alone, the summit of Cadillac Mountain is large enough that it’s fairly easy to find a spot to sit together away from the crowds. Bring along some snacks to enjoy (be careful with alcohol though – it’s illegal to consume in many areas of the park, including parking lots and pull-outs). If it’s not the dead of summer, you’ll likely want to bring along a warm blanket to snuggle with, as well. 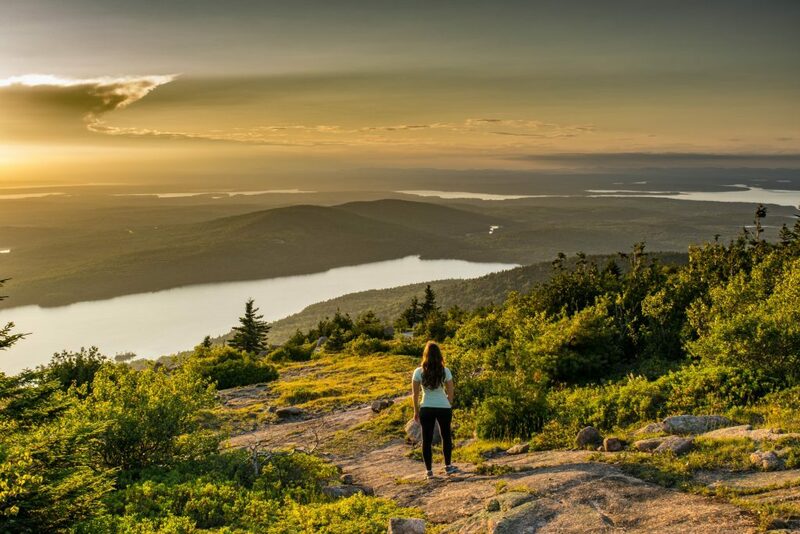 The hike up to the summit of Cadillac Mountain can make an excellent addition to your sunrise or sunset date, but if you and your beloved aren’t the hiking types, don’t worry – you can drive to the top as well! If you haven’t been to Savannah yet, let me paint you a picture! Imagine walking through a quiet alley covered by century old oaks on both sides, with Spanish moss hanging from branches. Historic houses, each one bigger and prettier than the last, rise in front of you at every turn. Magical sunlight streams through tree branches, making the whole city look golden. Try walking down Jones Street hand in hand with your beloved and not imagine the two of you in 40 years sitting on the porch of your own home. 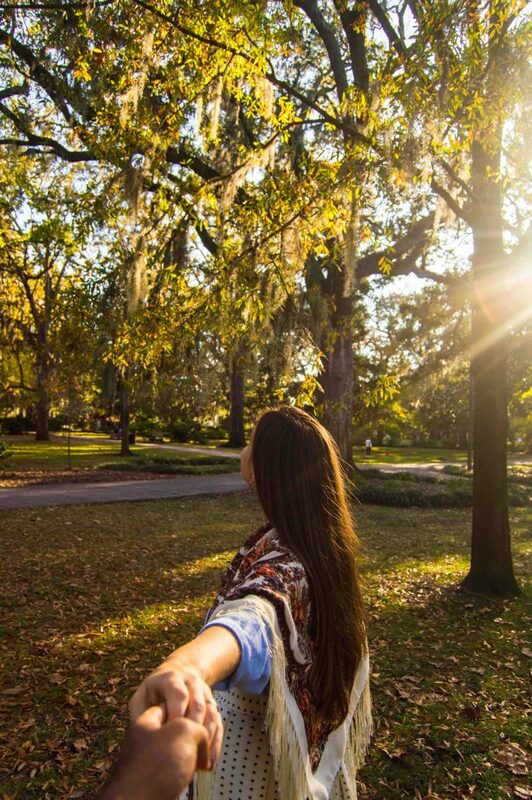 “Charming” is probably the most overused word in describing Savannah, and I try my best to avoid it; however, let’s be honest – Savannah looks like the whole reason for inventing the word “charming”. My husband rarely plans an outing for us. I generally do that. So he really surprised me once when we were in NYC for a few days. I wanted to see Phantom of the Opera but the tickets were sold out. When we met up in our hotel room after a day of independent sightseeing (we like to go our separate ways sometimes) and he dropped an envelope on the bed, I wasn’t sure what was going on. I was shocked and delighted when he told me tickets to the Phantom were inside and even more shocked when he told me he’d talked to the concierge and paid a little more to get these unobtainable tickets. We had a fabulous night at the theater, except for those noisy people behind us who wouldn’t shut up! We spent 2 months in the New England states, where the covered bridges are famous. We met some people at one of these New England’s covered bridges who told us that it is tradition to kiss under the bridges, and so we did. This tradition dated back to when young couples would sneak away from their parents, where they couldn’t be seen kissing. Paula and I kept this tradition up at every covered bridge we saw in the 6 New England states, and this was definitely one of our most romantic experiences in the US. West Coasters love to boast that ‘West is Best’ and, with these romantic experiences, we can understand why some believe that. From romantic wine tasting adventures to cosy getaways, the west side of the US is full of romantic experiences! Romance and relaxation seekers will love the variety of activities on offer in the beautiful Calistoga in northern California. Nestled inside the iconic wine region of the Napa Valley, it’s no surprise there are a host of scenic wineries in Calistoga, all dotted along the valley, with incredible views and even better bottles of red. 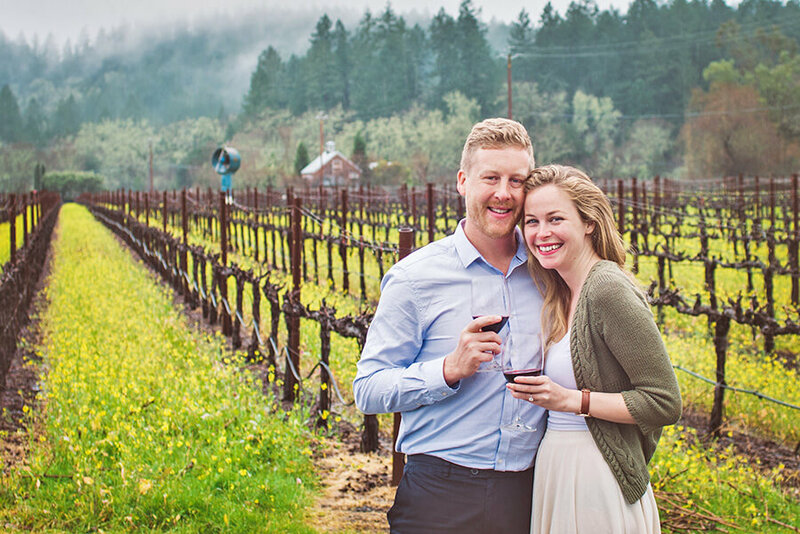 Couples can venture out for a day at a winery for some tastings and a tour, sampling some world class wines with the experts. After a day of wining and dining head back into the center of town and experience the famous hot volcano mud baths that really put Calistoga on the map. Vitamin and mineral rich mud, mixed with the natural hot springs, makes for a relaxing (and interesting) experience. Couple the mud bath with a nice long massage and a delicious dinner and you’ve got the perfect day of romance right there. Looking to pop the question to that special someone? Calistoga is the perfect spot to take advantage of the gorgeous settings, romantic activities and luxurious indulgences for a weekend you won’t forget. 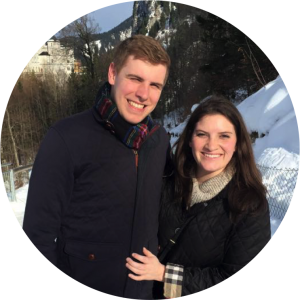 Take our word for it; it’s where we got engaged! My wife and I were able to make it to the San Juan Islands last summer for a romantic weekend. We went without high expectations, but found it to be an amazing destination for couples. 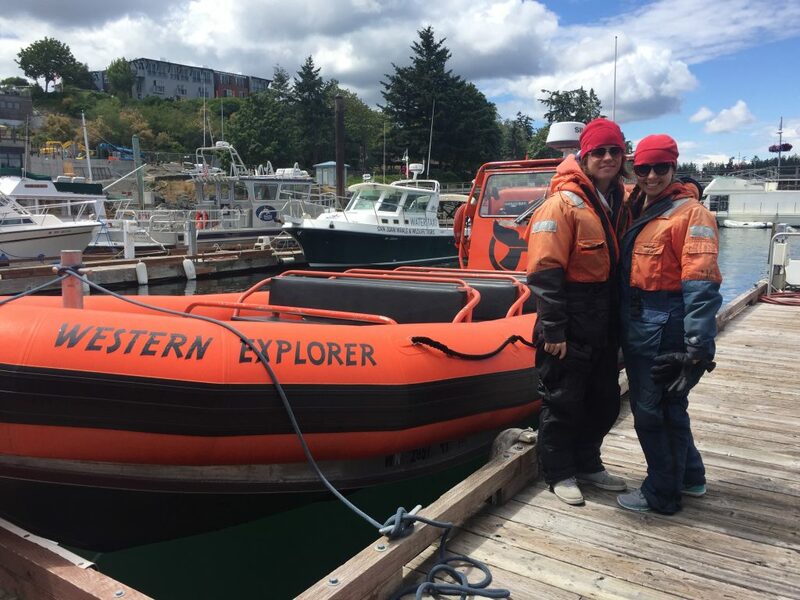 Being adventurous, we took a whale watching trip on a Zodiac style boat, similar to what the Coast Guard uses, and had a blast speeding along the water. Seeing two humpback whales breaching, tons of seals, and a baleen whale topped off the exhilarating experience. When you go, take some time to go kayaking, enjoy some great food and get to know the small harbors. Most of all, relax and enjoy your time together. In the evenings, we would sit in our bed and breakfast watching the sunset through the window or by the bay watching the water splash into the rocks as the sun set. If Lake Tahoe could be defined in a few simple words it would be called the “cozy corner” of the USA. 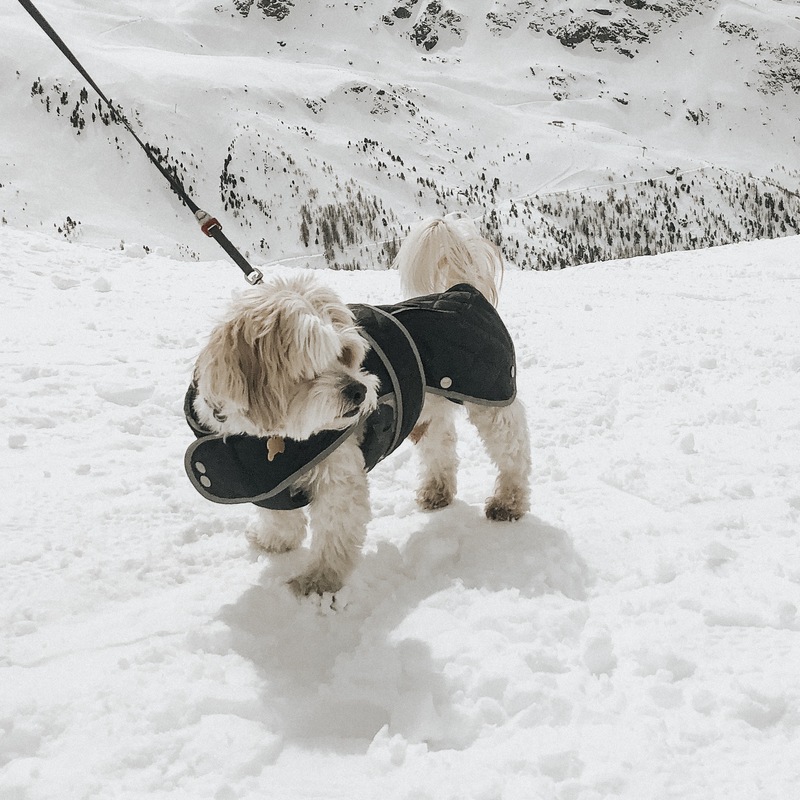 If you and your special someone are looking to escape to a quaint, charming, yet adventurous getaway location you can’t go wrong with a visit to the lakeside town of Tahoe City, California. Curl up by a stone fireplace with a glass of Cabernet at The Cottage Inn or stroll hand in hand among the redwoods while catching picturesque views of the lake and surrounding mountains. 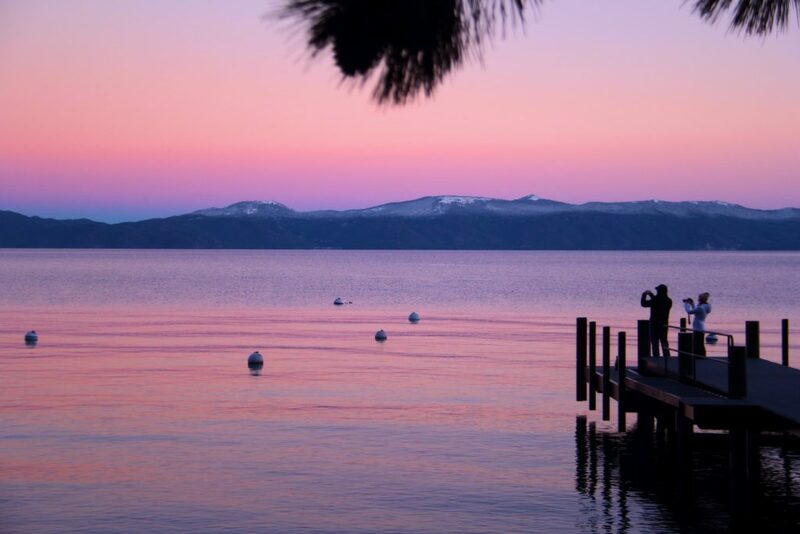 Take in a lively yet intimate meal at one of the towns local dining spots, such as the Bridgetender Tavern; and, while visiting, you can’t miss taking in a view of the sunrise peeking over the Sierra Nevadas. 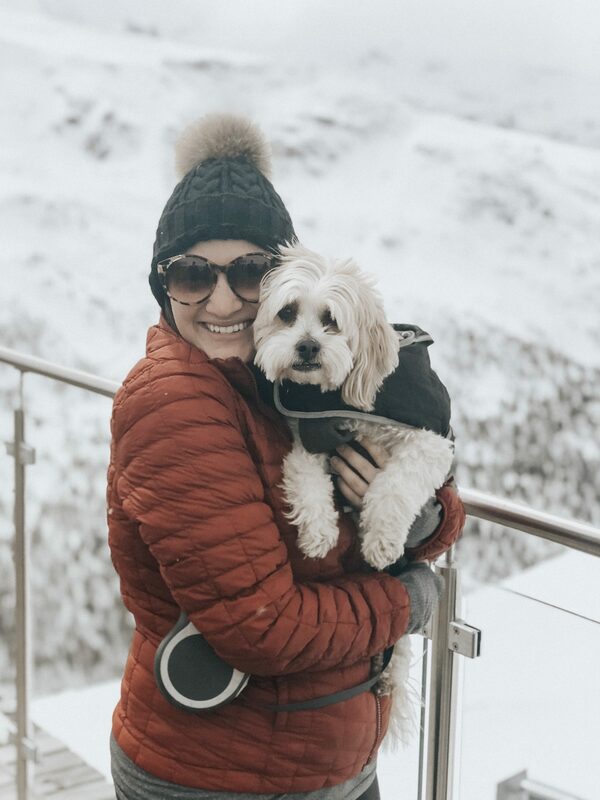 This year-round destination is the perfect spot to unplug from the rest of the world and connect with that special someone of yours. The most romantic thing we ever did in the USA was get married… and yes it was in Vegas… but we promise that’s the end of the cliches! 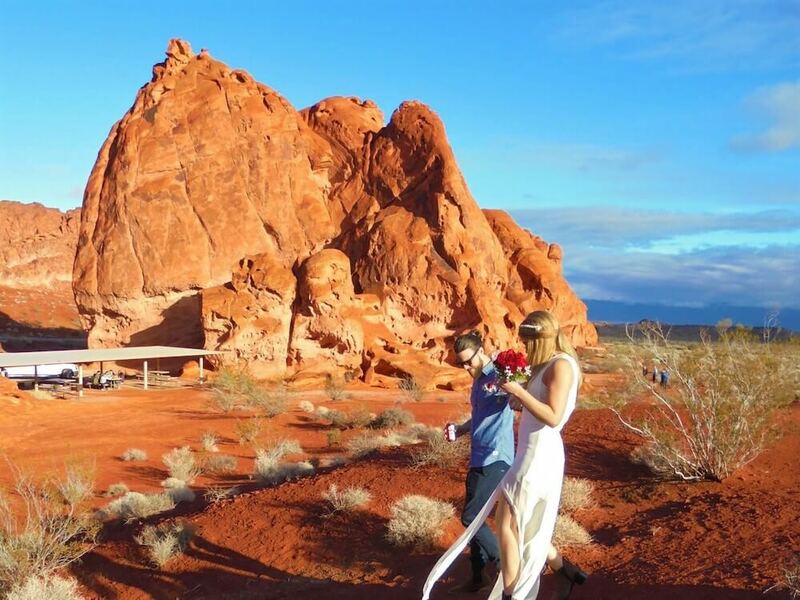 In fact we got married an hour’s drive outside of Las Vegas, in the Nevada Desert: The Valley of Fire State Park. This location was chosen by us for two-fold reasons. One, the photos you can take in this location are spectacular – it’s all blue sky meets red dirt and red rocks! Two, being that this is a state park, anyone can visit it for a small entrance fee, and explore at their own pace the many landmarks and hikes within. Sadly our time in the park was brief, around an hour, and the ceremony and wedding photos took up most of this time. But we’re not too worried as we now have the ultimate excuse to return with a picnic lunch and enjoy the stillness and natural beauty of this incredible spot like the few other park goers we saw that day. We can return for many anniversaries to come! Roadtripping with a partner can be hit or miss; you either rock out to your favourite playlist or end up squabbling over directions and who’s to blame for missing an exit. 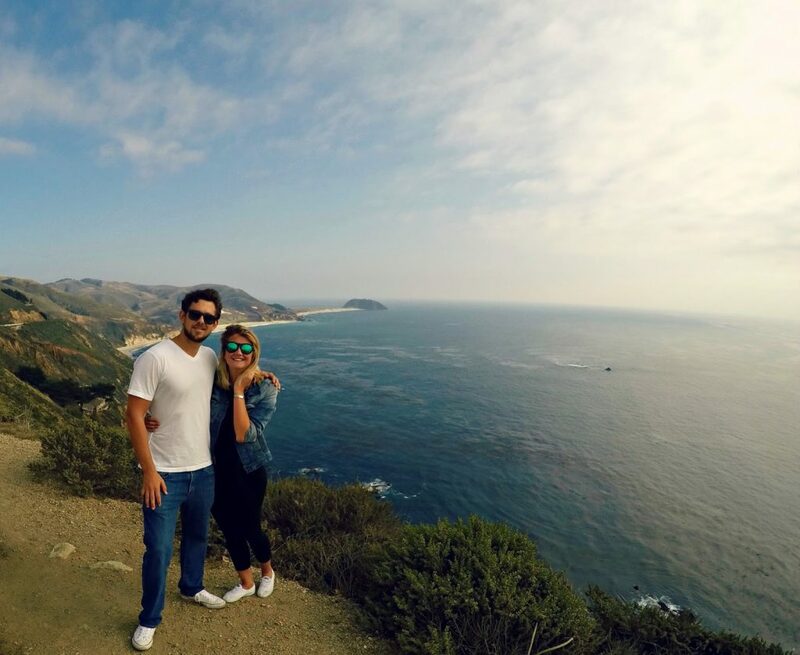 So when my boyfriend J and I decided to take a drive along the coast of California, I wasn’t expecting one of the most romantic ‘getaways’ we’ve ever had. Luckily, it was one long stretch of road with limited exits, so all we had to focus on was the spectacular view! We booked a cute little motel in Monterey and then mapped out our route from there – a 17 mile stretch of incredible coastline between Pacific Grove and Pebble Beach, that takes you through a wind-sculpted forest of cypress trees to a rocky coastline dotted with coves and tuck-away beaches. We visited at the end of August and it was really quiet, so we had every lookout spot to ourselves along one of the most unforgettable stretches of coastline. Highlights included searching for fairies in Pfeiffer Big Sur State Park, a lunch stop in Carmel Village, and pulling off of the road too many times to count to gasp at the view. Zipping along the coast, top down, wind in our hair – it was us against the world. One of the most romantic experiences of a trip to Hawaii is whale watching. To see these giants of the oceans in their original habitat will remain an unforgettable experience. 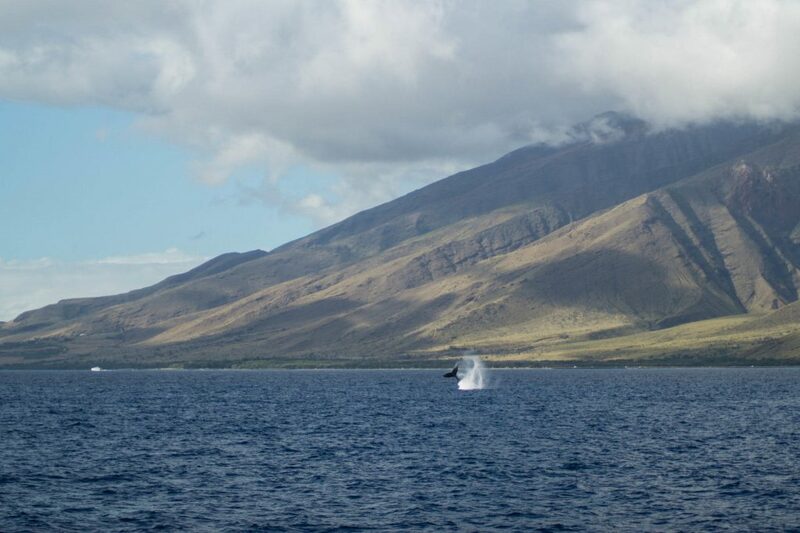 The most suitable time watch the whales off the west coast of Maui is definitely from November to the end of March, as the animals will then be found mainly in the sea straits between Maui, Lanai, Molokai and Kahoolawe. The best opportunity to see the majestic animals and their acrobatics is not necessarily from a boat, but from nearly anywhere close to the water. Our advice: Just sit on the beach with a drink in your hand and look at the horizon. It won’t take more than a minute for you to spot a whale or two that appear somewhere in the water. There is hardly anything more romantic. 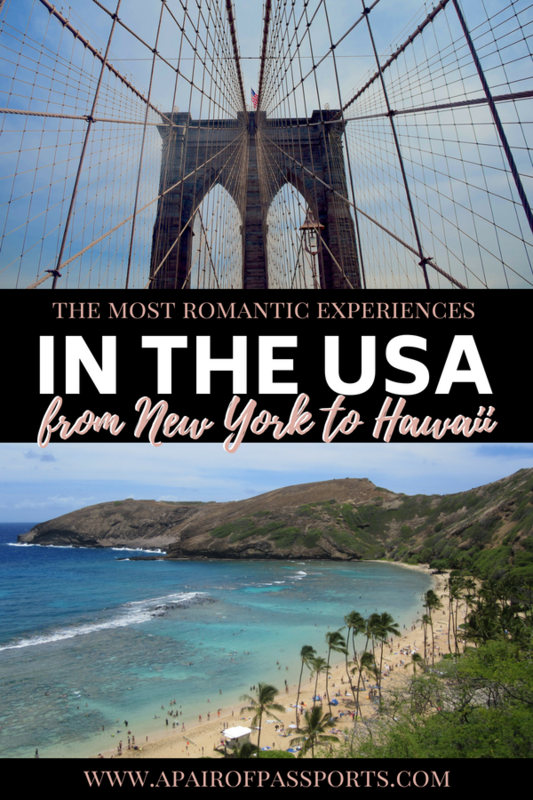 The Hawaiian islands are home to some of the most romantic places in the US that I can think of, having spent some time exploring quite a lot of the islands last year. Whilst exploring The Big Island of Hawaii, you will have the chance to ramble to the top of the infamous Mauna Kea mountain, home to some of the largest observatories in the world. From 13,000 ft, you can cuddle up with your other half whilst watching the sun set through the clouds. This is one of the highest points you can be in the world and I can surely tell you that viewing the sunset from this height really is an incredible experience. Once the sun has set, you’ll be asked to move away from the summit of Mauna Kea and head back down to the visitor centre at 9000 ft. But this won’t be the end of your romantic visit. From 9000 ft, you can gaze at thousands upon thousands of stars and even see the Milky Way with the naked eye! Mauna Kea is not only an educational place for budding Astronomers but can also be considered a fabulously romantic destination too. Incredible sunsets and the best stargazing available – what more could you ask for on a date? On our 36th anniversary, my husband and I enjoyed a holiday in Hawaii. We visited the Big Island, Lanai and Kauai. 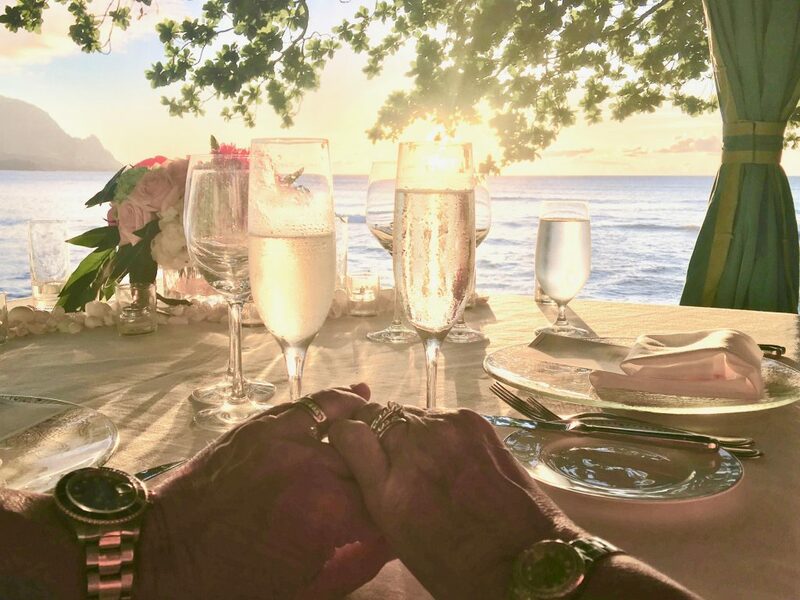 It is on Kauai that he arranged for the most romantic experience I have ever had – this says a lot as my husband is a very romantic guy. On our second night staying at the St. Regis, my Husband Kevin arranged a private tented dinner on the beach. Yes, just like on the show the Bachelor! In fact, exactly just like the show; however, we both did not realize that they filmed those scenes there. With the most perfect view of the sunset we enjoyed a wonderful dinner served by our own butler for the evening. As you know or probably have read, Kauai has gorgeous sunsets! The table was set perfectly with gorgeous flowers and crystal. After dinner was completed we decided to have dessert inside. Our butler led us to the main restaurant in the hotel, which was closed for that evening. They opened it for us only! My husband will have to come up with something really good to beat this one! Since our trips to the US mainly consist of visiting Kelly’s family and friends, we don’t usually have too many ‘romantic’ moments. Our favorite moments have actually been quite random – Sean’s first trip to Sonic, a fun night at a Nationals game, However, our most romantic experience was probably during Sean’s first trip to visit Kelly in Boston. Boston’s North End is an extremely popular destination for date nights. It’s quaint streets and delicious Italian restaurants are the perfect combination for a romantic night out. During Sean’s first trip to Boston, we enjoyed a romantic dinner at Trattoria di Monica, a tiny North End restaurant with only a handful of tables. There’s nothing more romantic than sharing a bottle of Italian wine in a cozy setting. If you love both seafood and Italian, Rabia’s is a great alternative. After dinner, wander Boston’s historic streets hand in hand before stopping for a drink in one of the many cocktail bars in the area. Or, if your sweet tooth kicks in, queue at Mike’s Pastry for their famous cannolis. 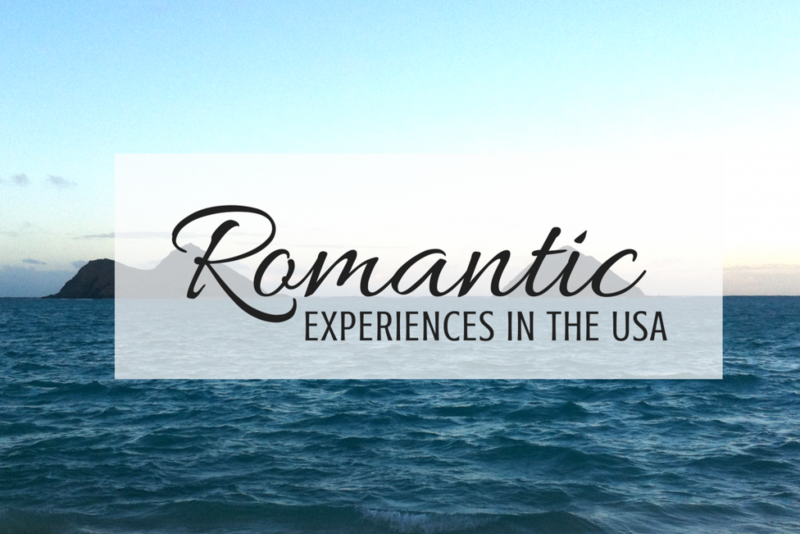 We hope this post gave you plenty of inspiration for your next romantic experience in the US! 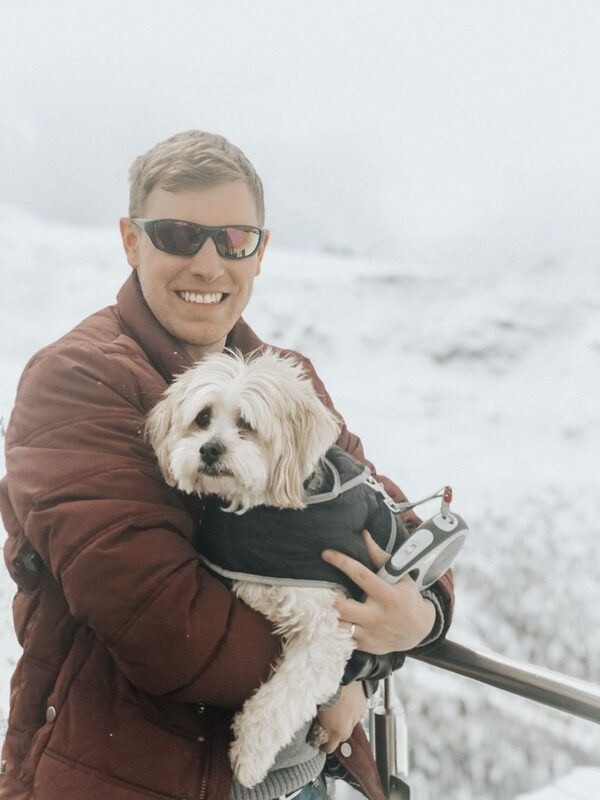 With whale watching, rock climbing, and wine tasting all making the list, we know that there are romantic things to do in the US no matter what your personal tastes are. If we missed your favorite romantic experience in the US, be sure to leave us a comment below – we’d love to hear your favorite romantic things to do all throughout the USA! Saving this post for the next time I vacation with my boyfriend! Thanks for sharing!